"A Great Escape" it truly is!! 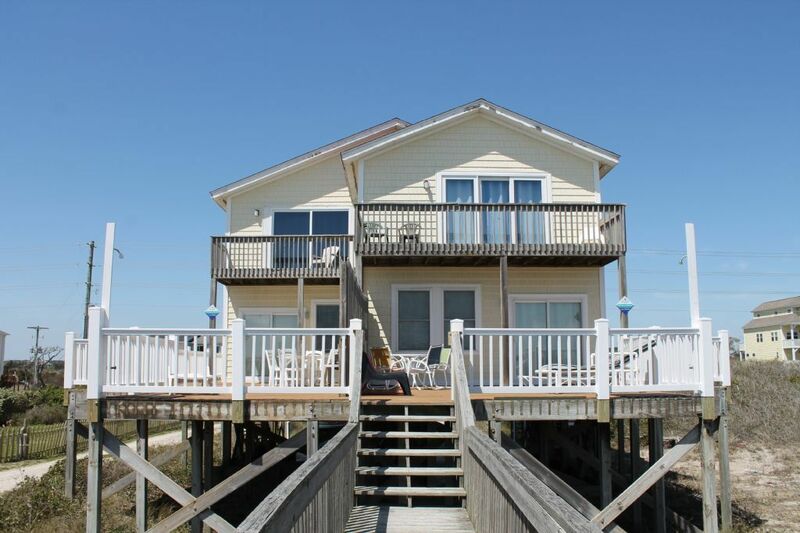 This amazing four bedroom duplex is located on the quiet shores of North Topsail Beach. Sleeping up to 10 people, this home is ideal for medium sized families or groups of friends. Just imagine sitting on the back deck listening to the ocean and having the convenience of walking to the beach on your semi-private beach access. The main level has a great open floor plan for easy communication from the kitchen to the deck. The kitchen is spacious with the dining area just off of it and additional seating at the bar area. The cozy living room is complete with three couches, one of which folds out int a queen sleeper sofa. The master bedroom leaves little to be desired. It has a queen size bed, private en-suite bathroom and private oceanfront deck overlooking the Atlantic. Bedroom 2 and bedroom 3 are on the street side of the second floor and both have queen size beds. Bedrooms two and three share a bathroom on the second floor. bedroom 4 is located on the main level on the street side of the home and also features a queen size bed. "A Great Escape" is in a superior location when it comes to spotting dolphins, searching for shark's teeth or just kicking back for a day of relaxation!! The only thing that this home is missing is YOU! “A Great Escape” is a duplex with a mirror property next door “Almost Heaven”. Together they can sleep 20!!! ?Non-Refundable Pet Deposit is NOT INCLUDED in rate and is priced PER PET. Please contact us for pricing on the pet fee for this property. Also, our vacation homes do not have many of the consumable items in stock for guest use (i.e. toilet paper, paper towels, soap, etc.). Once you book your vacation, we’ll provide you with a list of items that you may want to consider bringing with you on your vacation. Must be 25 years or older to rent this property. This property is managed by Access Realty in Surf City, NC. Don't see the week you want? Check availability at 'Almost Heaven North', its the other half of this Duplex and is a mirror image. Had an awesome time with the family! Beautiful beach! Can't wait to come back! Access Realty was there when we needed assistance! Location was great. Amenities not good. The location of the home was excellent, however the state of the property was less than ideal. The microwave was broken and the burners on the stove only worked half the time. There was hair in the master bathroom tub. Which also smelled like body odor. All shower heads were filled with mold and had no water pressure what so ever. Vent in upstairs bathroom leaking water and also molded. The sliding door out to get deck hardly functions. The deck is severely weathered and has splinters everywhere. Balusters were missing from the deck railing and were later found laying on he floor with rusted nails sticking out. We spent over $2000 to stay in that house for the week and were definitely not satisfied with the home. It needs some serious TLC. We stayed for 3 days, the weather and the beach were perfect. The house was overpriced for the quality. There was broken patio furniture, nails popping up on the deck, and an outlet cover missing in the dining area (not very good when you have a 1 year old running around). The location was perfect. Hopefully the owner will put a little money into the rental to make it safer and more inviting. I will absolutely return to North Topsail, but will not rent this specific property again. Thank you for taking the time to review your stay. We are glad that you had perfect beach weather in April! We will make sure that the outlet cover and any broken outdoor furniture is replaced. We hope you'll choose Access Realty again for your vacation to Topsail Island. We found this property on VRBO but rented it through Access Realty. It was a pleasure to work with Access Realty from booking to check in. They were always helpful, friendly and quick to respond to an email or telephone call. The owner was great to work with too, but we did it through Access. The property was as described, no surprises. It was clean and everything worked but the ice maker and it may have been cut off for the winter. The rooms are small but we had 7 adults and had plenty of room for a 4 day stay. There is a nice concrete drive way and parking area. We felt that it was the smallest amount of steps to get into a property and also down to the beach. It is on the main road through North Topsail but in November there was very little traffic. The kitchen furnishings are minimal but adequate..we had a traditional turkey dinner with no problem. The carpets are new and the property very neat. We would certainly consider it again and we will certainly check with Access for availability on properties to fit our needs. Thank you, Jim! I'm so glad you enjoyed your stay. We hope to see you again next year! Thank you for choosing Access Realty! I recently stayed in "A great escape" and was highly disappointed in our stay. I had planned for a great girls weekend for my friends and found that the unit was very unclean (dishes were dirty, carpet was stained everywhere) as well as NO AC was functional on the first floor. Although I do commend the realty staff for bringing fans and a portable AC unit our first night, I am disappointed that I had to call numerous times on Saturday to see if the maintenance worker had come to service our unit. It wasn't until I had made the last call (around 3pm) when I found out our AC needed a new part and was not going to be fixed during our stay. I am upset that during my beach day on Saturday, I had to call numerous times and was not kept updated by the staff. My friends that were sleeping in the bedroom on the first floor, in 80 degree temperatures (even with the fans running) did not have an enjoyable stay and I find this unacceptable. The unit did not provide any toilet paper, no hand soap, no salt or pepper. Dish detergent was provided, but the dish washer did not work well at all and we found ourselves hand washing the dishes we used. The carpets are VERY stained and should be replaced. The walls are dirty and need a new coat of paint. The one positive is the location. It is beach front and super easy/short walk down the walkway to the beach. There is an outdoor shower to wash the sand off - which is a plus. I am rating this unit as "poor" based on the AC not working on the first floor (temp remained 81 all weekend), the carpets are extremely stained/dirty, walls are dirty, dishwasher does not work. This unit has potential, but it needs work! CANCELLATIONS: Reservation amounts not refundable unless re-rented at same rate and subject to $65 cancellation fee. BOOK DIRECT: Exact cost after taxes/fees will be determined at booking. 3rd party sites sometimes charge a separate service fee and Access Realty has no control over these fees. Please consider booking directly with Access Realty in Surf City, NC to avoid up to 10% in service fees! * For questions or concerns, please contact Access Realty at 1-800-TOPSAIL or info@accessthebeach.com.